OXFORD, Miss. – The Ole Miss women’s basketball team lost a close, 66-58, game to Indiana University – Purdue University Indianapolis (IUPUI) Friday in The Pavilion at Ole Miss. The Rebels entered the game with a 1-0 record, after having won their season opener against Norfolk St. on Tuesday, 60-42. The visiting IUPUI Jaguars also sported a 1-0 record under nine-year head coach, Austin Parkinson, whose record with the Jaguars 142-111. IUPUI, who made a trip to the WNIT postseason tournament last season, brought nine returning letter-winners and three starters from that successful team into the game against the Rebels. Jaguars’ sophomore center Macee Williams (23 points, 12 rebounds), the Horizon League Preseason Player of the Year, ultimately proved the difference in the game. Coach Yo’s Rebels showed flashes of very solid play in the team’s season-opener. 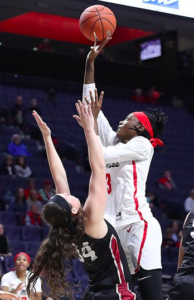 Defensively, Ole Miss held the visiting Jaguars to several scoring droughts that lasted up to five minutes or longer, and the emphasis on physicality and defensive prowess was clear against the Jaguars as the Rebels were able to hold IUPUI to 34% shooting. Coach Yo has pushed for the team to share the ball more, evidenced by the multitude of assists coming from all over the floor. Against IUPUI, the Rebels’ assist leader was Jhileiya Dunlap who notched 5 assists and played an integral part in helping the Rebels score throughout the game. The first half saw Rebel starters Mimi Reid (Fr. ), Shandricka Sessom (Sr.), Crystal Allen (Sr.), Cecilia Muhate (Sr.) and Jhileiya Dunlap (Jr.) hit the floor against the Jaguars and control the opening tip to start the game. 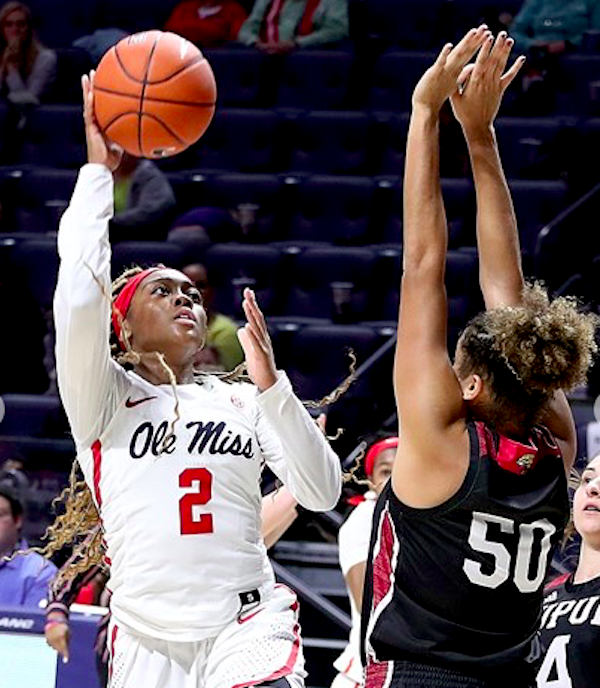 Forward Dunlap, who picked up a double-double last week, took the ball for herself and gave the Rebels their first 4 points of the game before Shandricka Sessom then tallied her first 3-pointer of the game. Within the next few possessions, Allen and La’Karis Salter got on the board and put the Rebels up 11-7 midway through the 1st quarter. Coach Yo’s team did a great job early on of creating good ball movement and involving all the players on the floor, as they were able to pick up 4 assists on 6 made shots within the first 10 minutes of the game. The Jaguars, however, pulled closer to end the first quarter, picking up some key offensive rebounds and getting the Rebels in foul trouble. That, in turn, helped IUPUI draw even with the Rebels at 14-apiece at the end of the first period of play. The second quarter saw IUPUI quickly turn the ball over for the first time in the game, and the Rebels took advantage, pushing their lead to 20-16 at the timeout. But the Jags then proceeded to notch some steals (as well as fouls called against the Rebels) that helped give IUPUI a 30-27 lead at the half. IUPUI’s held a solid advantage on the boards at halftime, 29-18. At the start of the second half, the two teams continued to exchange baskets, with the Jaguar lead holding steady at around 4 points. Ole Miss began to get in some foul trouble, with Allen and Shannon Dozier each reaching three, and IUPUI soon extended its lead to nine, 50-41, as the 4th quarter began. After Coach Yo fired up her team in a timeout, she watched as Allen put the Rebels’ on her shoulders and brought the Rebels back to within four, forcing the Jaguars to call a timeout as their lead was in jeopardy. As the clock wound down, IUPUI hit some free throws that yet again increased the Jaguars’ lead. 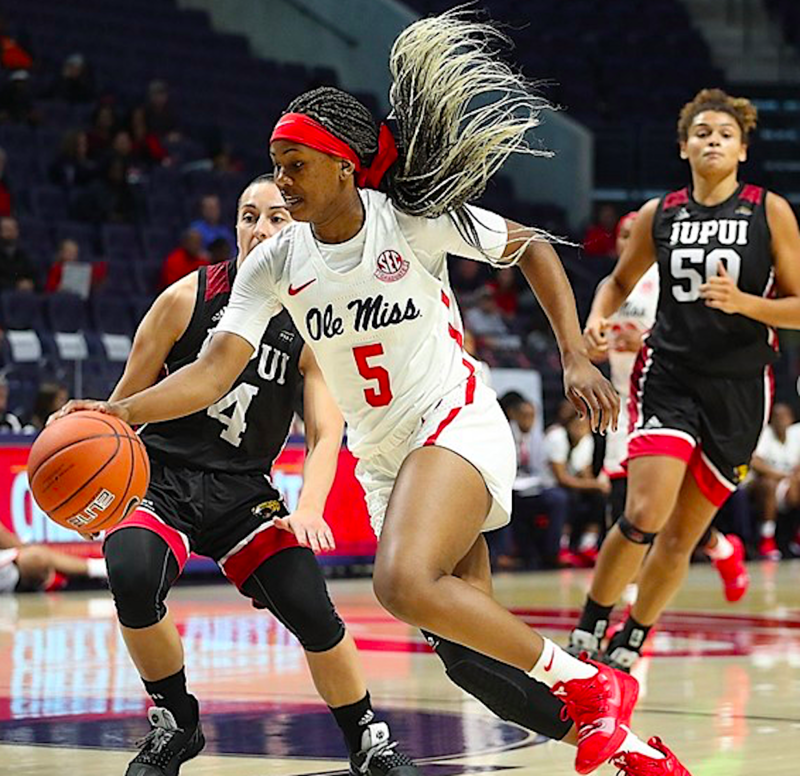 Freshman guard Mimi Reid led a comeback-attempt for the Rebels that fell just short as Ole Miss recorded its first loss of the season, 66-58. “I knew this was going to be a challenging game for us,” said McPhee-McCuin. 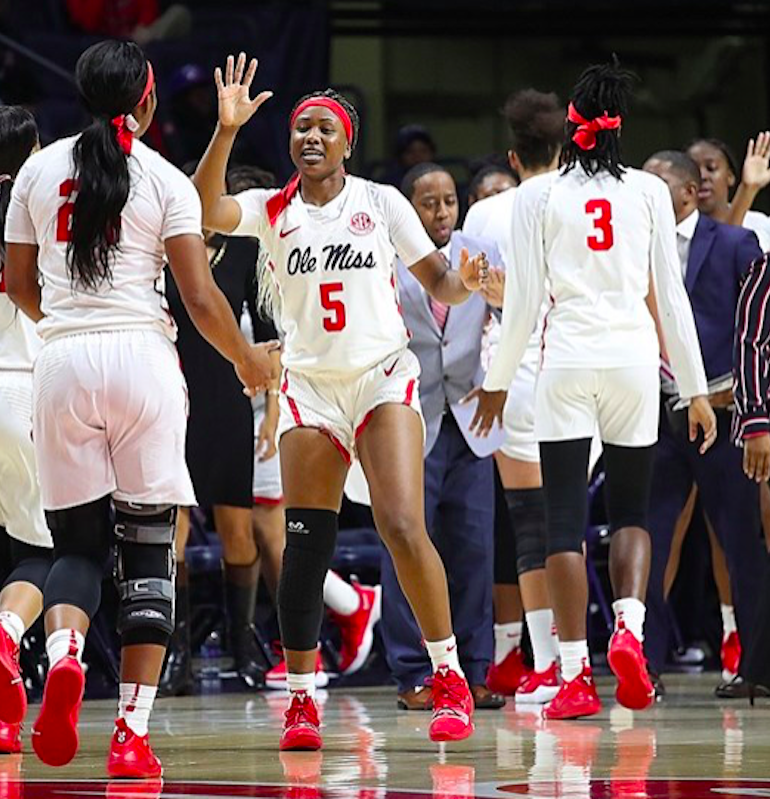 The Ole Miss women’s basketball team will be back in action Wednesday, hosting Temple at 6 p.m. (CT). The game will be televised on the SEC Network +.